Every large BERG Pedal Go-kart is equipped with either a BFR system, BFR-3 system, E-BFR system of BFR-XXL Frame. But what is this exactly and what is the difference between these systems and the frame? We will explain this to you. 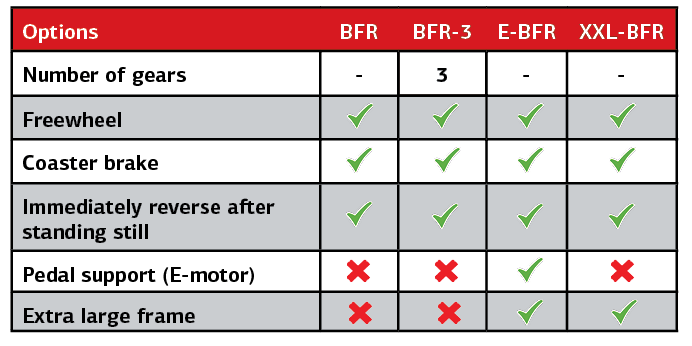 BFR stands for: Brake, Freewheel and Reverse. • Each Pedal go-kart has a freewheel mechanism that ensures you can keep the pedals still while the wheels are turning. • Each Pedal go-kart also has a coaster brake..
• Each Pedal go-kart can immediately reverse after standing still. The Pedal go-karts with BFR-3 system have an extra function. These Pedal go-karts have as many as three gears! This makes accelerating faster or riding up a hill much easier! This frame is specially designed so that not only young and old can enjoy go-karting, but also taller people. This new go-kart has no less than 8 seat positions and is 10 cm longer. This means that young and old, small and tall can enjoy this go-kart. We have also reinforced the frame to make it even stronger. Naturally, this frame is also equipped with pneumatic tyres, BFR and swing axle. The XXL frame is available in combination with most standard theme packages. The E-Go-karts (E-BFR) are equipped with a 250W E-Motor delivering pedal support. There are 4 different levels of assistance: ECO, TOUR, SPORT and TURBO. You can ride around for 2 hours in these go-karts, without having to recharge the battery. The E-Go-kart can reach speeds of up to 16 km per hour. Children from the age of 6 can enjoy years of fun with this go-kart! Another advantage of the E-BFR go-karts is that they are all built with the XXL-Frame allowing multiple seat positions suitable for both child and adult to enjoy.